Chinese New Year this year falls on the 5th February, and will mark the beginning of the Year of the Pig. It seems like a fitting time to write a tribute to this wonderful animal’s great contributions to science, research, and innovation. Since their domestication, pigs have become an increasingly important animal in biomedical research due to their many shared physiological and anatomical features with humans. The pig domesticated itself approximately 9,000 years ago, and like dogs, were attracted to the abundance of waste created by human settlements. Our relationship with these highly intelligent and social animals extends beyond agriculture. From dissections by ancient Greek physicians to the production of insulin for diabetes treatment in the 1920s, pigs have helped to advance medical knowledge and treatments for many centuries. Pigs are often praised as being one of the best animal models for research into the development of potential treatments for human diseases. Although it may seem peculiar to use pigs over our closer relatives, the non-human primates, pig, and humans are anatomically and physiologically very similar. This likeness includes organ size and function, fat distribution, disease progression, and skin similarities. Pigs produce a greater number of offspring and carry a lower risk of disease transmission than non-human primates. 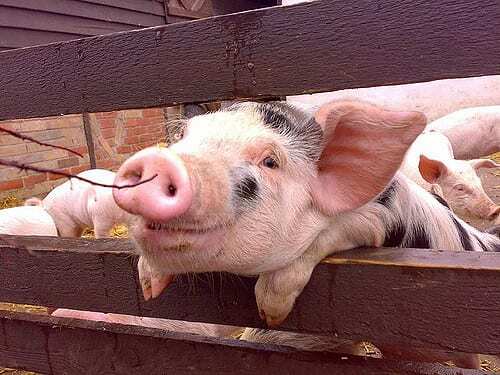 Furthermore, the lack of emotional attachment resulting from pigs being viewed as primarily a food animal makes them a favourable alternative to other non-rodent animal models such as dogs for scientific research. Xenotransplantation, the practice of transplanting tissue from one species to another, is currently one of the most active areas of pig research. One example of pig-to-human transplantation is bioprosthetic heart valve replacement, which is already a common surgery for thousands of patients every year. Scientists are attempting to take this a step further to solve the worldwide shortage of organ donors by making pig-to-human organ transplantation a reality. Promising progress was made in the latter half of 2018 when Professor Bruno Reichart from Ludwig Maximilian, University of Munich, reported that two baboons which had undergone genetically engineered pig heart transplantation had survived for 6 months, double that of previous experiments. Furthermore, a lab at Harvard University has successfully managed to eliminate all the strands of potentially pathogenic DNA called porcine endogenous retroviruses (PERVs) from pig cells, significantly decreasing the risk of disease transmission during xenotransplantation. Though it is unlikely pig-to-human heart transplantation will be available in the near future, there is still much excitement surrounding this area of research, particularly with the advent of the gene editing technology CRISPR. Pigs have also been used to model a great number and variety of diseases including Alzheimer’s disease, cystic fibrosis, cancers, and cardiovascular disease. New surgical techniques are often practised on pig organs, and pig skin is used for numerous studies into wound healing, dermal toxicology, and the effects of radiation and UVB light. The intelligence of pigs has also been studied. Notably, Dr Stanley Curtis carried out experiments on the ability of pigs to play video games by creating a joystick game with treats for moving the computer cursor to match drawings. The study found that after just five to ten trials, the pigs figured out the game at the same amazing speed as chimpanzees! The Year of the Pig is said to bring fortune and wealth, and as celebrations commence it should be acknowledged that pigs are more than just ingredients in food recipes or cute pets. Pigs have played an integral role in saving many lives and have great potential to save many more.